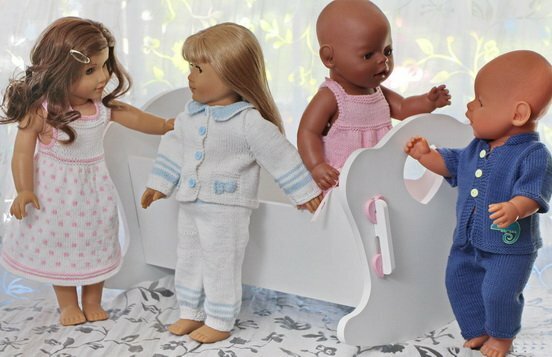 White Night Gown, Pink Baby Doll, Blue Pajamas boy, Blue Pajamas Girl (All in One). 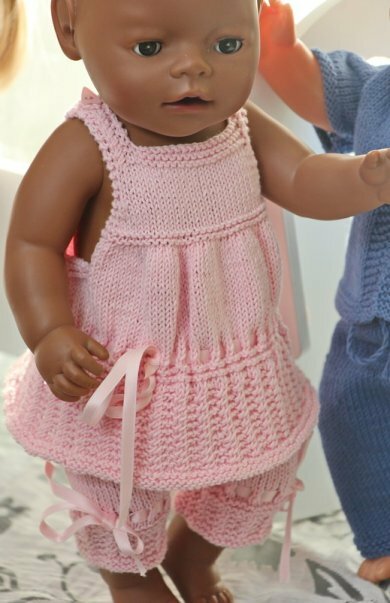 This pattern fits17" - 18" dolls like American Girl doll, Baby born and Alexander doll. ... it would be a great idea to design some night clothes patterns for your doll. 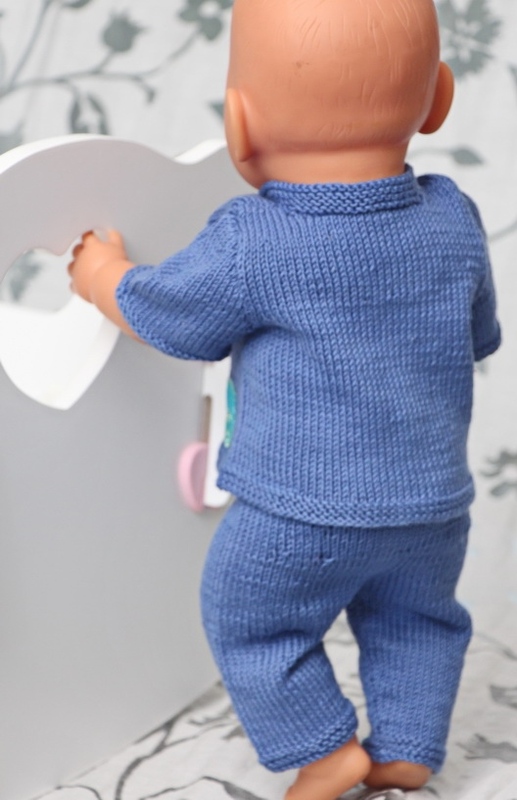 The night clothes is knitted in thin cotton yarn, called Mandarin petit and produced at Sandnesgarn here in Norway. The yarn is soft and I have chosen pastel colors. 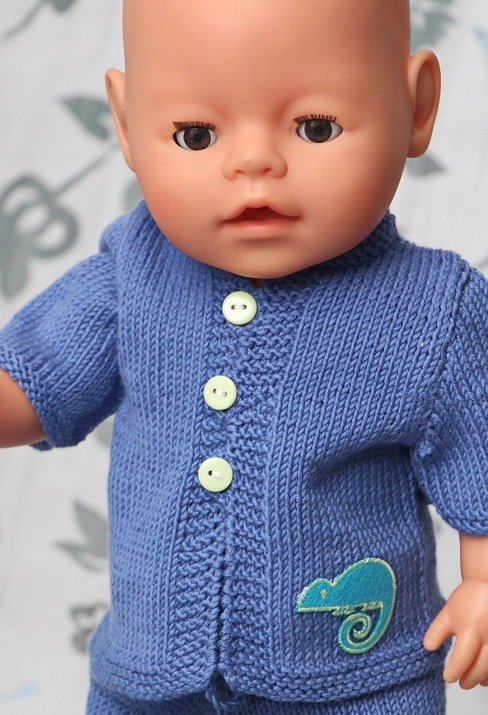 The yarn has tension similar to Lanett baby wool, the yarn I often use for my doll clothes. Both the pants and the top of the pajamas have a nice pattern edge. 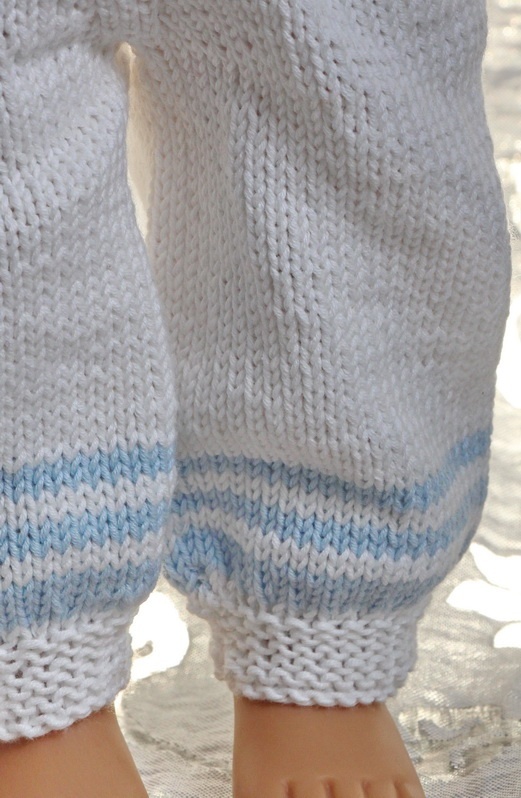 Above the pattern mum has knitted rows of eyelets and pulled beautiful silk bands through, bundled with bows. Tiril has a very god time dressing her doll Petra for the night in this lovely baby doll. She put the doll to bed and calls out for grandma to come and see. Kaja as well has another doll called Julia. Julia is a very beautiful doll. For her mum has knitted a lovely white pajamas. 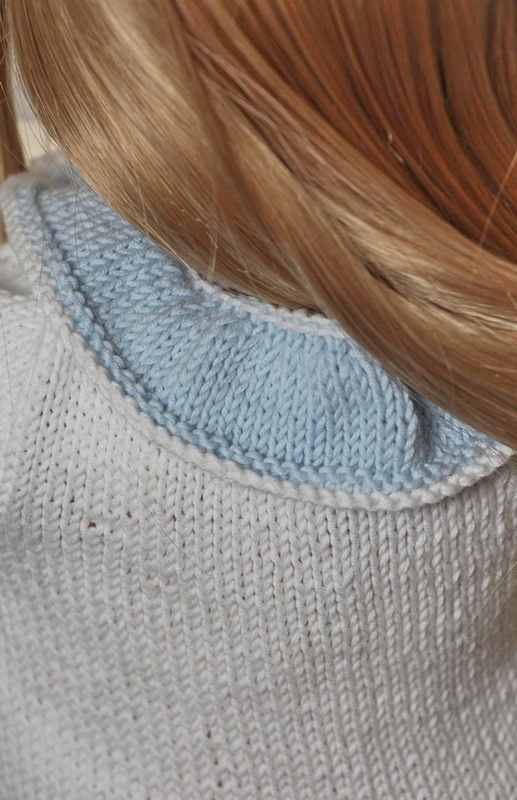 The pajamas has a nice blue collar with a white ridge along the edge. 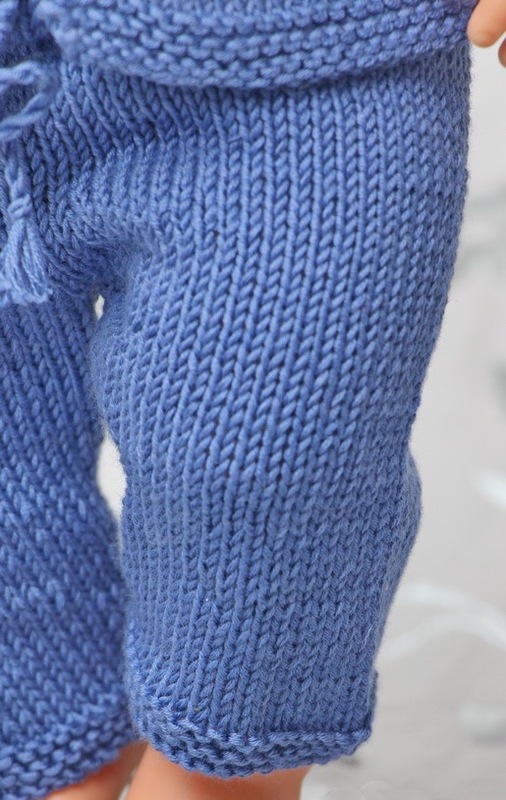 Round the arms and round the legs mum has knitted light blue stripes! This pajamas is just lovely! 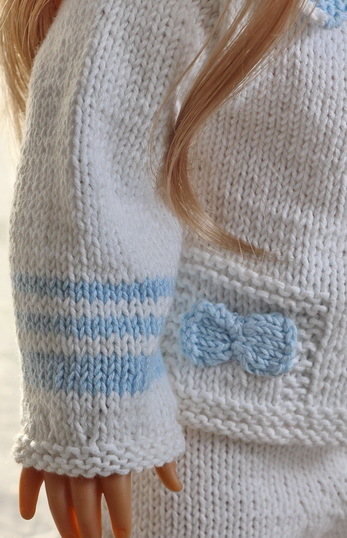 In addition mum has knitted small bows in light blue. These are sewed on to the little squares at the front sides. 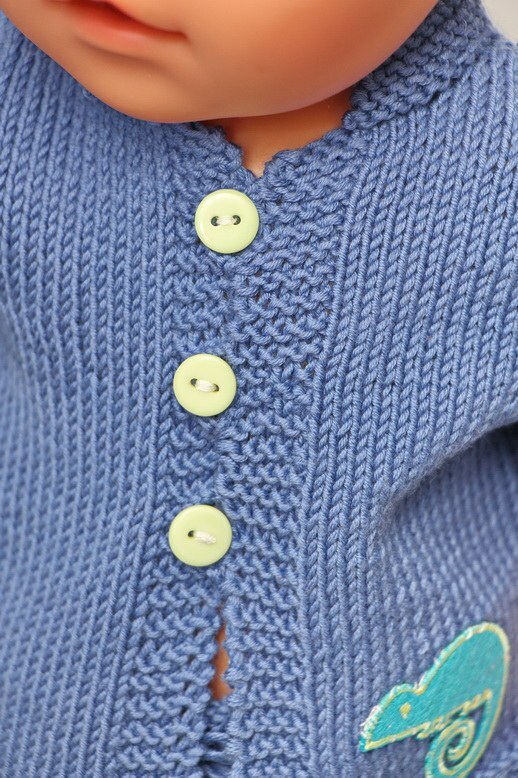 Buttoned with small blue buttons Julia looks lovely in her new night clothes. Kaja as well put her dolls to bed and ask grandma to come and have a look. Sander has got a lovey nightgown. The pajama has short sleeves and short legs, lovely for summer days. 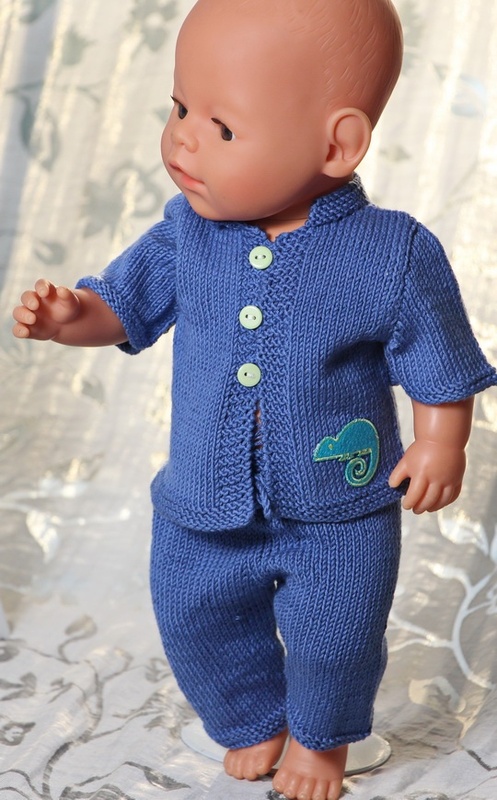 They pajama is buttoned along the center front with small buttons in light green. Mum has also found a little application and sewed it to the front of the pajamas. It is a little mouse in light green. Kaja love this nightgown and after putting it on Sander she hold him high up and she is so happy! One of Tiril’s dolls is named Lotta. For her mum has knitted a lovely white night dress with pattern in pink. Round the arms and round the neck she has crocheted pink edges. And round the edge of the dress and round the waist she has knitted ridges. With small pink buttons on the shoulders Tiril think that nobody has such a beautiful doll as she has. Neither had anyone such a beautiful nigh dress! It is summer holiday. Kaja and Tiril will spend their holyday visiting their grandparents. Both girls have 2 dolls each, and they both want the dolls to go with them on holiday. They love to play with their dolls. 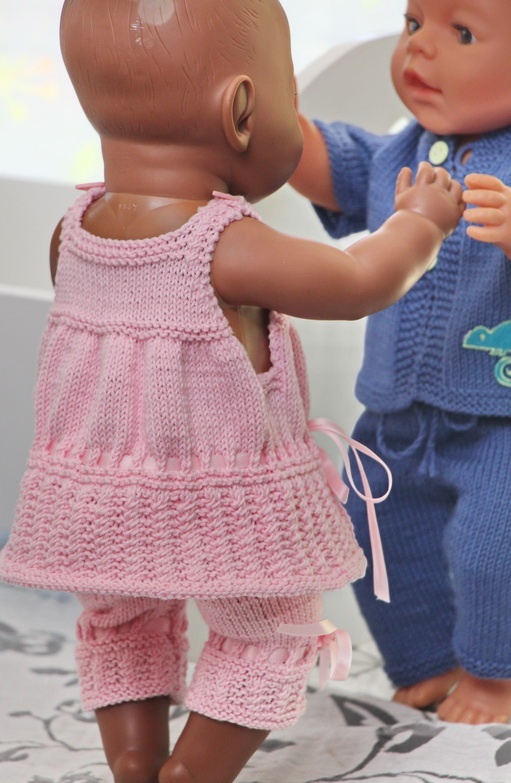 Mum has just knitted lovely nightgowns and nightdress for the dolls. The girls pack small suitcases with doll clothes and off they go! At grandma’s cabin they play with their dolls out in the sun all day. They look forward to the evening! 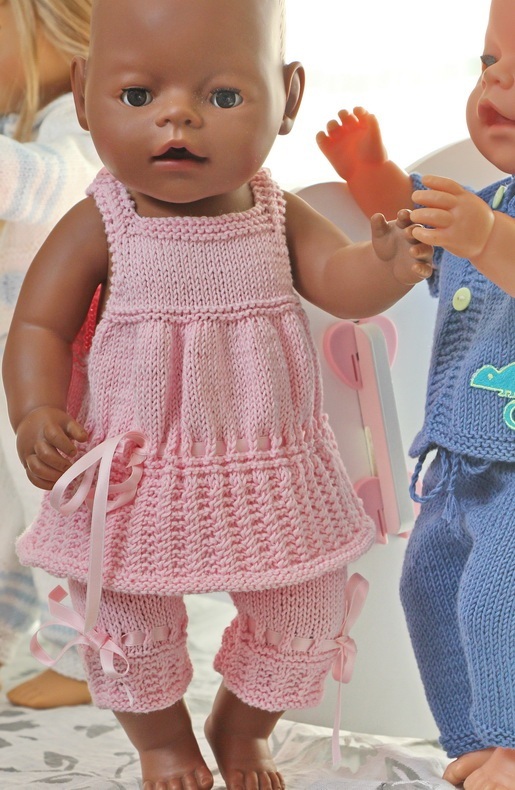 Then they will dress their dolls in all these nice night gowns and night dress mum has knitted for them! Tiril’s other doll is named Petra. Petra is a baby doll. For her mum has knitted a lovely pink pajama. Tiril loved this beautiful night gown and was very happy with it. When grandma comes she says that the dolls are lucky having such a nice “doll-mother”! She says Tiril’s dolls are very cute there they lay in bed ready for a good night’s sleep. Grandma says once more that both girls are small lovely “doll-mums” for their beautiful dolls. They say Good Night to the doll, and walk into the kitchen for a lovely meal before going to bed! Kaja’s doll is a little boy baby doll named Sander. Kaja loves the blue color so for her dolls mum has chosen blue colors. Mum knows that the most beautiful color Tiril knows is pink. That’s why she has knitted this little pattern in pink.